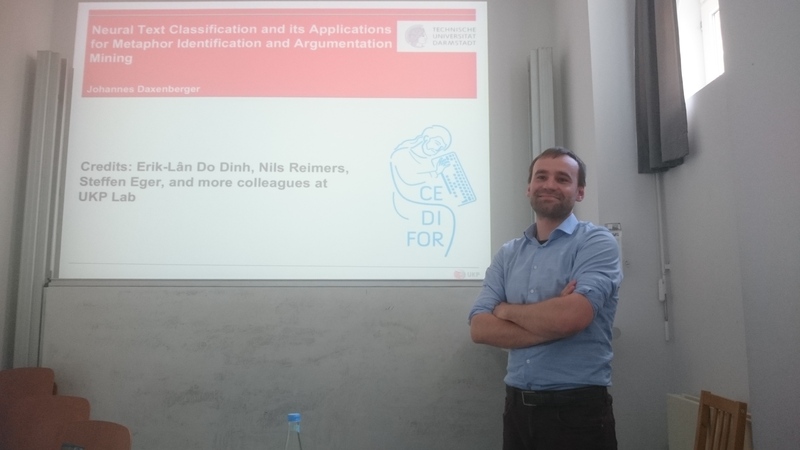 July 3, Johannes Daxenberger (Darmstadt) gave a talk in Frankfurt on “Neural Text Classification and its Applications for Metaphor Identification and Argumention Mining“. In the introductory part of his talk, he presented the overall structure of CeDiFor, a BMBF-funded research center of Digital Humanities in the Rhein-Main area. In the main part, he reported on text classification and how this can be used to address two linguistically complex questions: the detection of metaphor and the detection of argumentive structure in essays. 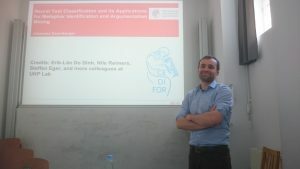 Blog post on a similar talk by Daxenberger at the University of Cologne, containing a good summary of the talk.